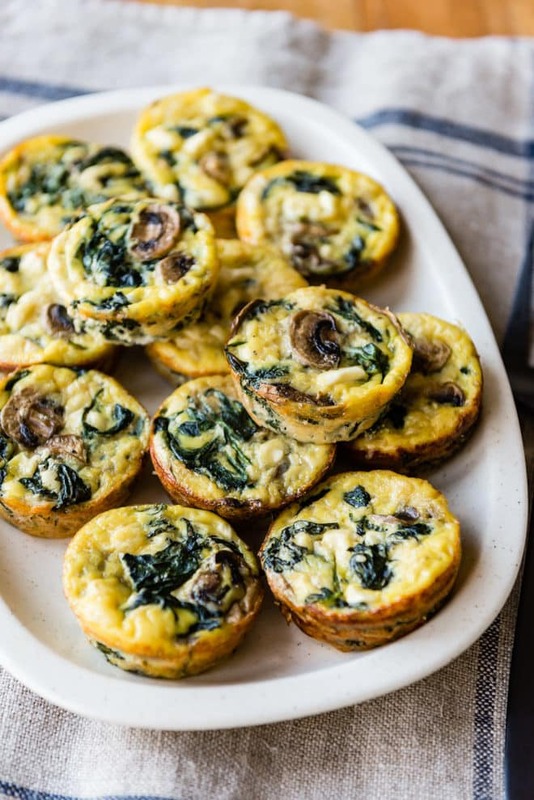 Egg Muffins make a healthy, freezer-friendly breakfast or snack option! Make a batch to keep on hand and customize with your favorite fillings. 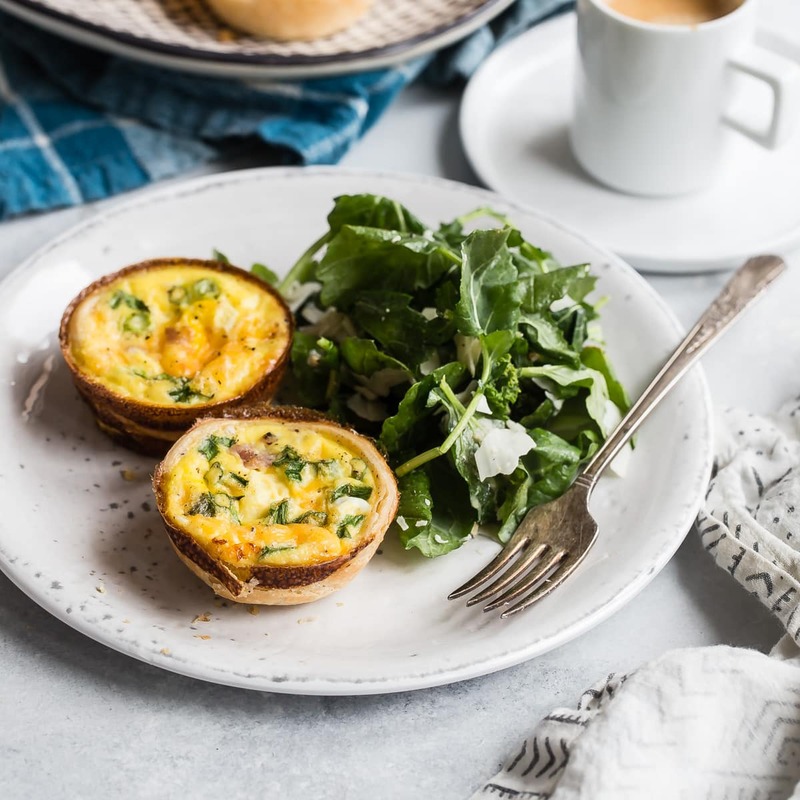 Whether you need a quick and easy breakfast option, want to eat healthy or gluten free, or just like to keep your freezer stocked, these easy Egg Muffins are right up your alley. 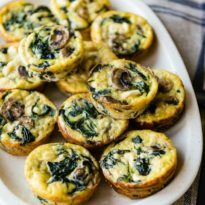 I love the combination of spinach, mushrooms, and feta, but you can put anything you want in your Egg Muffins. Clean out your fridge, eat more veggies, or stuff them with all your favorite things. Choose your filling of choice. Cooked sausage or bacon, veggies, cheese, or chopped up cheeseburgers are all great choices (and I wanted to see if you’re paying attention). Add your fillings to a greased muffin tin. Then, top with beaten eggs. How long do you bake Egg Muffins? Bake in a 375-degree oven for 20 to 25 minutes, until the eggs are firm to the touch and heated through. There should be no visible liquid. Baking times will vary if you use mini muffin or jumbo muffin tins. For best results, thaw any frozen Egg Muffins in the refrigerator overnight before reheating in the morning. Refrigerated egg muffins can be reheated in the microwave in about 1 minute. Or, bake them straight from the freezer, in a 400-degree oven, for 5 to 10 minutes. How long can you keep egg muffins? 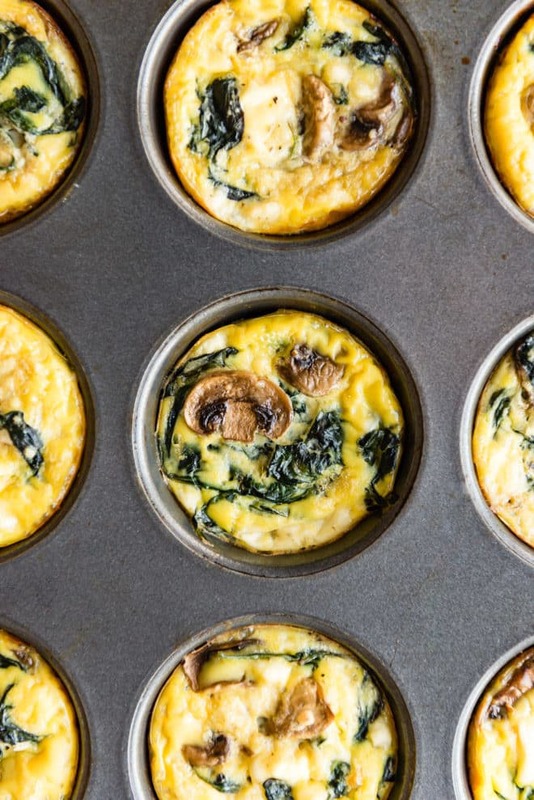 Store leftover Egg Muffins in the refrigerator and use within 4 days. Or, individually freeze the muffins in a single layer on a plate. Then, transfer to a freezer-safe bag and freeze for up to 2 months. 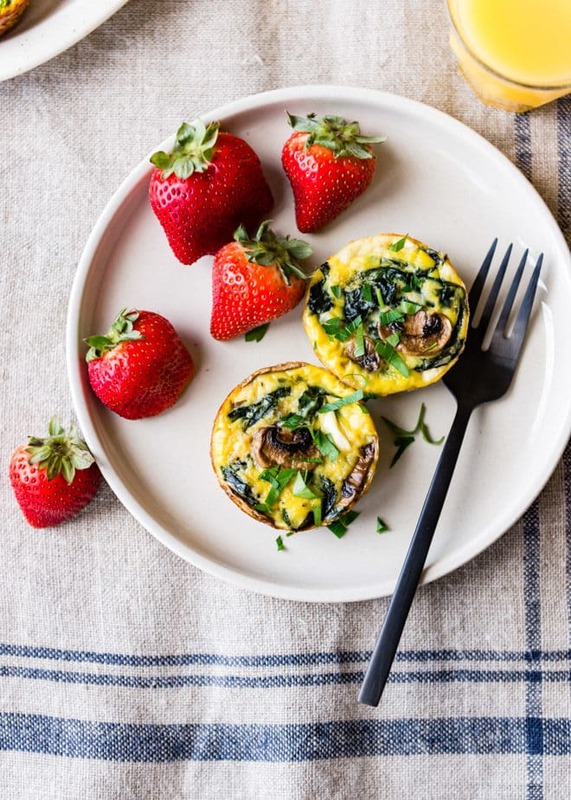 Egg Cups with Mushrooms, Spinach, and Cheese are the perfect high-protein meal or snack to have on hand in the fridge. Preheat oven to 375°F. Coat a muffin tin with nonstick cooking spray. In a large skillet over medium-high heat, heat oil until shimmering. Add mushrooms and 1/4 teaspoon salt and cook until softened and the mushrooms have released most of their liquid, about 5 minutes. Using a slotted spoon, remove mushrooms from skillet to a large mixing bowl, leaving any remaining oil and liquid in the skillet. Add to the skillet with water and sauté until tender and wilted, about 10 minutes. Drain and place in a clean kitchen towel. Squeeze and twist the towel to remove as much liquid as possible. Sauté in pan until heated through, about 5 minutes. Drain and place in a clean kitchen towel. Squeeze and twist the towel to remove as much liquid as possible. 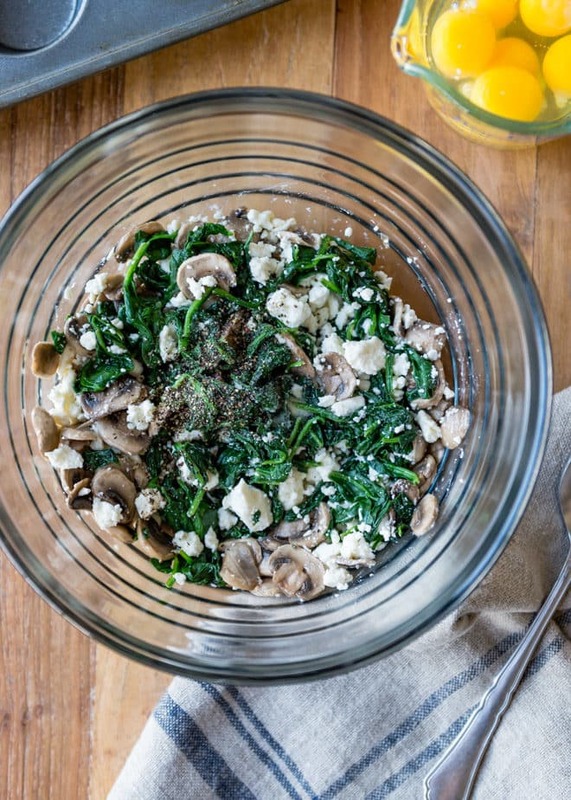 Add the spinach to the bowl with the mushrooms. Stir in eggs, cheese, 1/2 teaspoon salt, and 1/4 teaspoon pepper. Divide egg mixture evenly among 12 muffin cups. Bake until a toothpick inserted comes out clean, about 25 minutes. Cool slightly before removing from muffin tins (the egg cups should come out easily). Serve hot or at room temperature. Store leftovers in the refrigerator and use within 4 days. Cool and transfer to a single layer on a plate. Freeze until solid, at least 30 minutes, then transfer to a freezer-safe bag. Freeze up to 2 months. Microwave them straight from the freezer until heated through, about 1 minute. To save time, omit sautéing the mushrooms in oil. Slice them very thinly and add them straight to the muffin cups raw. Hi meggan, I am making your egg cups with spinach, mushrooms and cheese. They look wonderful and I’m really trying to watch my carbs so this sounds perfect! Do you have any idea how many calories are in each cup? Thanks so much for the recipes! Hi Linda, about 94 calories per egg muffin. Thanks! I hope you love them! Hi Jenny! The recipe makes 12 egg muffins. Sorry for the confusion. I wrote “6 servings” because 1 serving is 2 egg muffins. Does that make sense? And then if you see the recipe takes 6 eggs, it might not seem like enough, but once you add everything else it will fill 12 regular-sized muffin cups. If you have any other questions or I still don’t make sense, just let me know! And I hope you love them. :) Thanks Jenny, happy weekend! I am on a diet right now so I’m also trying to watch my carbs. These are very simple and look very tasty , 6 of these cups are 187 calories so each one would be about 31 calories :) and you can always substitute ingredients to make the calories lower! Good luck on making them hope they turn out. Just made these today with fresh spinach from my neighbors garden. I made them not as healthy, I added about 4 crumbled strips of bacon. I also added about a 1/2 cup of sweet onion, that I sautéed with the mushrooms in a bit of the bacon grease. They turned out amazing. Even my neighbor enjoyed them too! I made some of these with just spinach, kale and mushrooms. They look dark on the outside. I can’t see any of the yellow from the egg on the outside or inside. I don’t know if I used too much olive oil (probably 2 tablespoons) or if it’s just the kale. But I am worried about eating them. I made them for a healthy breakfast and I don’t want it to be unhealthy because of too much olive oil. I also used an olive oil spray for the pan. Is this normal? Hi Roberta, sorry you are having issues! First, if the cups are super dark on the outside, it might be that your oven is hotter than mine and the cups were done sooner. However, I wouldn’t worry about eating “too much” olive oil. If it’s real olive oil, it’s a healthy fat. Then again, everyone has a different definition of health (I personally don’t think olive oil is a bad idea). I would check your egg cups earlier, as soon as they seem set and don’t jiggle in the middle. Wondering if you really need to saute all of the veg beforehand or if you can get away with just mixing everything together then baking without sauteing? Hi Rachel, it’s a good question. My worry would be, if you don’t saute the mushrooms they will add a lot of water to the egg cups as they cook. However, that might not actually be the case. I have some recipes for mini quiche on the blog, and a mushroom one in particular, and the veggies go in raw. However, the mushroom pieces are super tiny so I don’t know. I am willing to test these egg cups without cooking the veggies and hopefully your right, it would be awesome to cut out that step! Thanks for the question! Thanks for the reply Meggan! I tried it without sauteeing and it turned out nice. I didn’t notice any extra water, or if there was then it was minimal. No doubt sauteeing would make it even better but time is of the essence in this household. Thanks for the simple, healthy and scrumptious recipe! Can I freeze these or refrigerate them for an easy breakfast-on-the-go?? Hi, How many calories would the larger muffin cups be (The 6 muffin foil cups) instead of the 12 reg ones. Instead of the feta, I would like to add cheddar cheese. One cup? Just made these. They’re great!